The Revolt of Snowballs unpicks a rare and turbulent event which occurred in 1511 and investigates the meaning behind it. On January 27, 1511, the island of Murano was the scene of an exceptional event during which the representative of Venice, exercising power in the island on behalf of the Serenissima, was hunted by the inhabitants under a shower of snowballs and the sound of a hostile clamour. This book uses microhistory techniques to examine the trial records of the incident and explores the lives of the Murano’s inhabitants at its heart. The book begins by providing a detailed introduction to life in Murano during the sixteenth century, including its political framework and the relationship it shared with Venice. Against this context, the political skills of Murano’s inhabitants are considered and key questions regarding political action are posed, including why and how people chose to protest, what sense of justice drove their actions, and what form those actions took. The latter half of the book charts the events that followed the revolt of snowballs, including the inquest and its impact on Murano’s society. 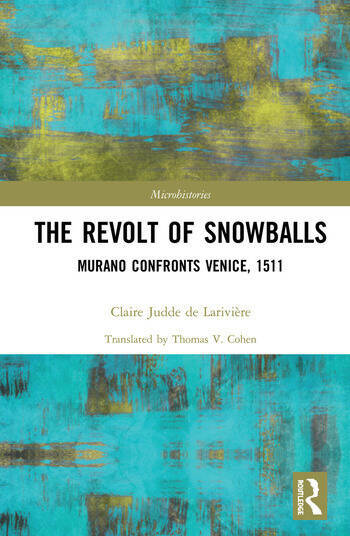 By putting Murano under the microscope, The Revolt of Snowballs provides a window into the cultural and political world of early modern Italy, and is essential reading for historians of revolt and microhistory more broadly. Chase off this dog who has ruined Muran! Claire Judde de Larivière is Senior Lecturer at the University of Toulouse and honorary research fellow at Birkbeck, University of London. Her previous works include Naviguer, commercer, gouverner. Économie maritime et pouvoirs à Venise (XVe-XVIe siècles), 2008; "‘Le peuple est la cité’. L’idée de popolo et la condition des popolani à Venise (XVe-XVIe siècle)", Annales HSS, 2013/4 (with Rosa M. Salzberg); and, ‘The Urban Culture of the Ordinary People. Space and Identity in Renaissance Venice (fifteenth-sixteenth Centuries)’, Medieval Urban Culture, ed. by Andrew Brown and Jan Dumolyn, Turnhout, 2017.